At the end of the year, I came across something called “One Word 365” on Twitter. I explored what it meant. Everyone picks a word relating to their own journey, a word they need to practice. The point is to not just set resolutions for the new year, but to be stretched in new ways. The word should inspire and encourage growth. I pondered a few days before I officially chose a word. I had to make sure it was the right word. I thought about intentional, action, and run. Another word remained in the front of my mind. Focus. I continued to return to the idea of focusing, and FOCUS seems to incorporate my other options. I want to be intentional about dedicating the year to working towards writing goals. Last year I started to take steps to chase my dream. I said yes to blogging and found great online communities for writers. At first I didn’t want to post regularly, but I slowly saw the value in consistent writing. Memoir Mondays launched in November. As a writer, I have not learned to plan well yet. I’m still figuring out my action plan. The bigger picture is writing a book; the everyday is creating an outline and finding stories to post on the blog each week. I can work on the book, but I have to remember it doesn’t begin with typing out a full manuscript. Writing in recent months has taught me it begins with sharing words now, building the momentum, and gaining further direction as I go. It is an active pursuit of the work. I will no longer simply walk through my days; I will run after dreams. I will run after these things I love. And in order to make progress, I have to think about the long term and focus on completing a few tasks each day. Otherwise I am floating and flitting between projects or putting tasks off until tomorrow. I didn’t only agree to choose a word for 2014. Before the new year arrived, I heard of two challenges that I knew I needed to join. I hesitated a little because one didn’t offer much information. Jon Acuff posted a short notice seeking “Adventurers” and this intrigued me. I soon found out he wanted to initiate “30 Days of Hustle”. 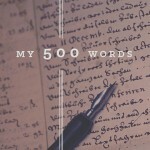 Jeff Goins created the other challenge called “My 500 Words”, encouraging others to write at least 500 words a day throughout the month of January. These challenges excited me and I wanted to be a part of groups that would help hold me accountable. I signed up and awoke to the new year with an eagerness to see what I could accomplish in one month. Maybe I’m starting to learn what it means to be brave and what it means to jump. Either way, I will gladly keep learning to move forward with courage. 2014. This is the year for focusing. I’ve already written over 2000 words in four days and my action plan is here to stay. I will prepare for my days and write with FOCUS.